Learning to be a thatcher takes years of hard work. An apprenticeship, the standard way of becoming a trained thatcher, lasts for four years. This guide couldn't possibly teach you how to thatch but it will hopefully give you a better understanding of the process and all the skills that go into it. 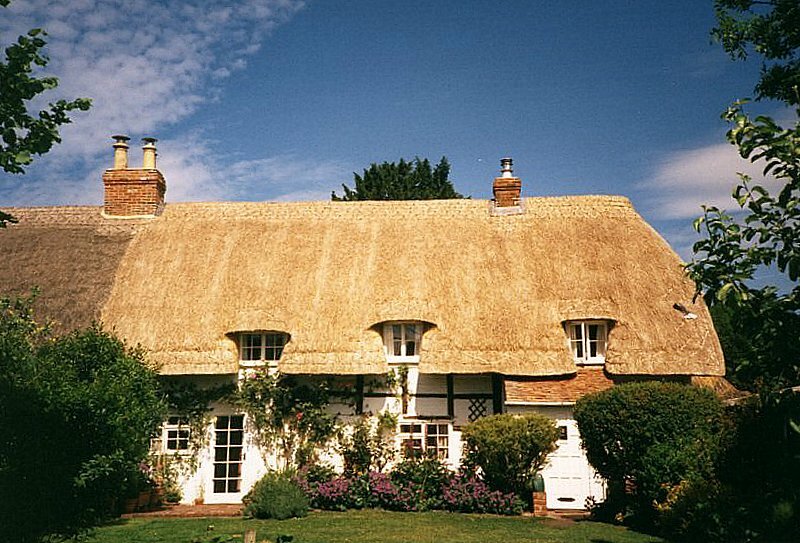 In the past, a wide variety of materials have been used to thatch roofs; turf, bracken, heather, rushes, reeds and many others. Thatchers, who were in the main locally based craftsmen (and, very occasionally, craftswomen), would have utilised whatever was abundant, cheap and performed reasonably well. 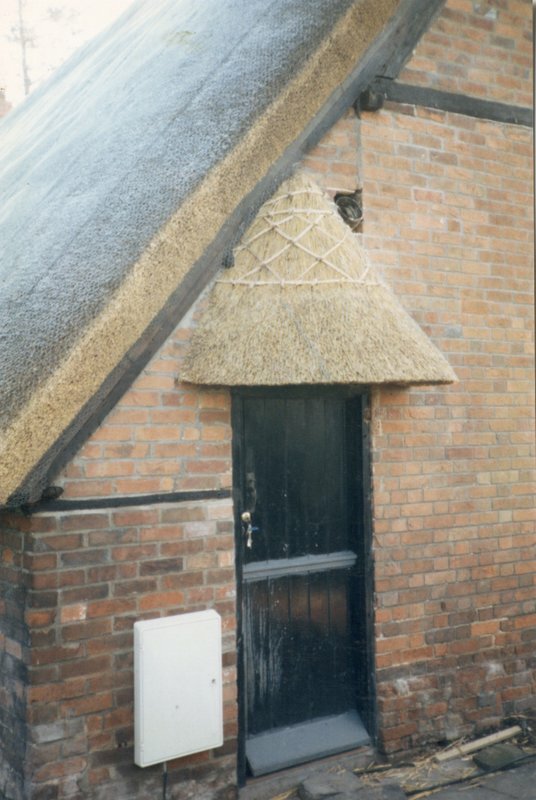 However, by the twentieth century (with the exception of parts of Scotland and other isolated communities) the main materials used were cultivated cereal crops (usually wheat) and water reed with fen sedge being used in some areas to form the ridge of the roof. This material is the threshed crop of (usually) winter-sown wheat. It is normally threshed by machine. The threshing process removes the grain and separates it from the straw. The straw is then tied in bundles by a trusser and delivered to the thatcher. Long straw requires more ground preparation than either of the two following materials. The straw is heaped, dampened and drawn before it is ready to be applied to the roof. 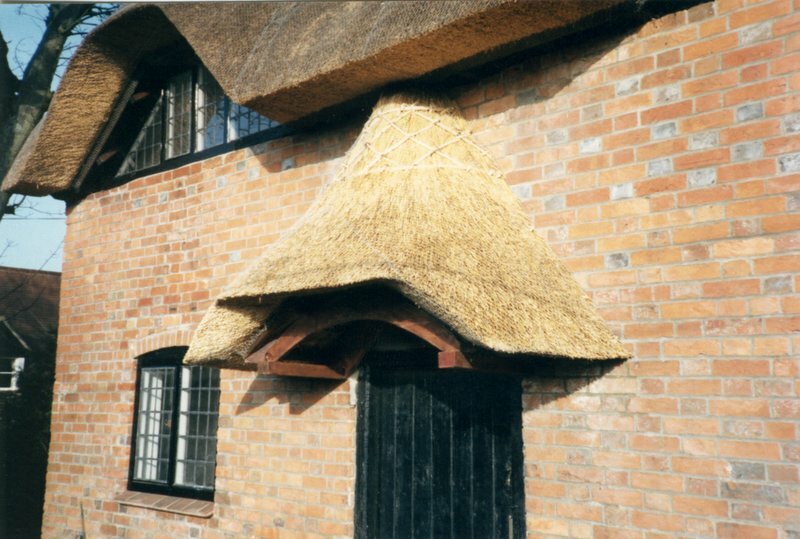 Unless they are subsequently sheared, long straw roofs exhibit a mixture of ears and butts on the surface and have a more shaggy (some say 'poured on') look than the other two kinds of material Eaves, gables and occasionally hips have external wooden fixings known variously as 'liggers', 'runners' or 'rods'. This material was used occasionally in the past in some parts of the country. 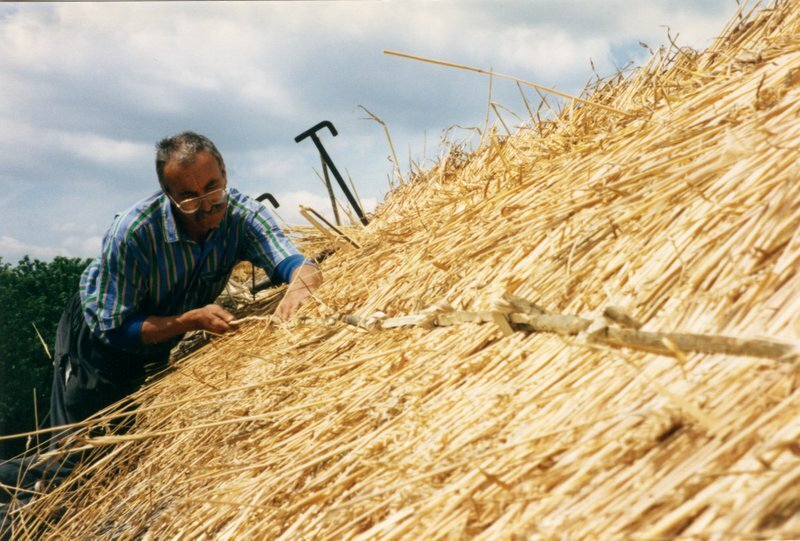 Today, rye straw is rarely used for coat work although some thatchers use it to form their ridges. Water reed (Phragmites Australis) is known to most of the public as Norfolk Reed from the great reed beds of Norfolk. However, it is a wetland plant grown in other parts of England albeit in smaller quantities than in Norfolk. It is also imported into this country from many European countries, (Austria, Hungary, Turkey, France and Poland among others) to supplement the U.K. crop. In the past, harvested by hand, the vast majority is now machine cut and then bundled. Often fifty or so individual bundles will be bound together with wire strapping to facilitate handling and delivery to the thatcher. Water Reed requires no preparation other than sorting and grading before being fixed to the roof. The basic raw material (i.e. Wheat straw) is the same as for long straw but in this case the wheat is passed through a reed comber fixed to the top of the threshing machine, which removes the grain, extraneous weeds and leaf and leaves the straw unbruised. This material is now known as reed, for the way in which it is applied to the roof. After being tied in bundles, all the butts (the bases of the wheat stems) are at one end of the bundle and all the ears are at the other. 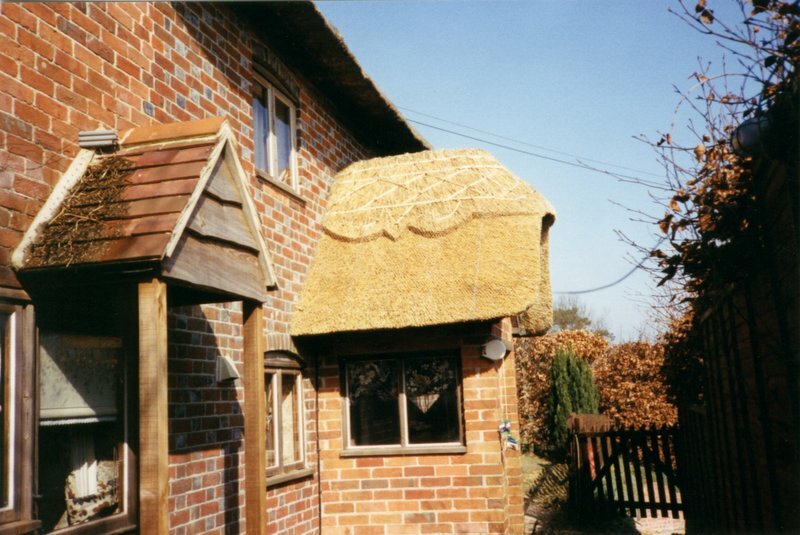 Less preparation is required from the thatcher before combed wheat reed can be fixed to the roof than with long straw. Some growers of wheat for thatching have adopted modern stripper-heading techniques in recent years but machine combed wheat reed is still by far the most common. A relatively modern wheat / rye cross which is used in the same way as combed wheat reed. It is favoured by some thatchers while others feel it has not been in use long enough to assess its long-term performance. This material is used exclusively for ridging especially in the east of England in conjunction with water reed. 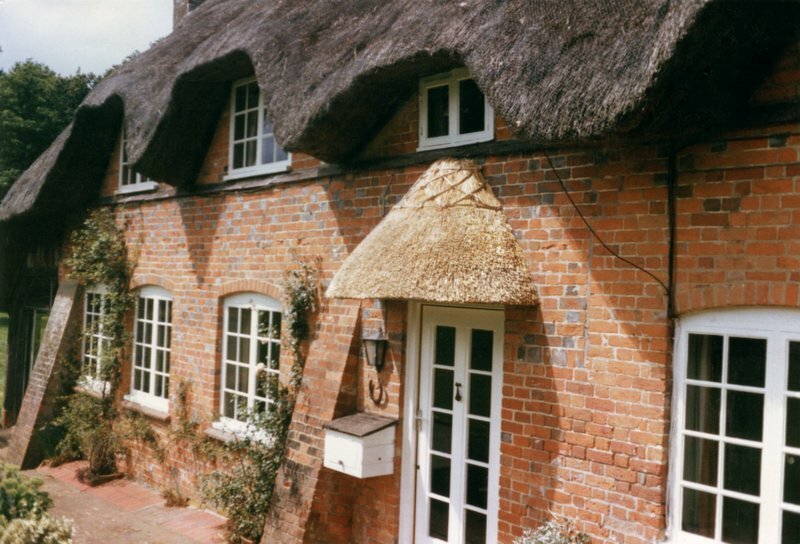 There is evidence that sedge was used in the past to thatch complete roofs although it is not used as a main coat material today. There are many different jobs a thatcher has to be ready to deal with. 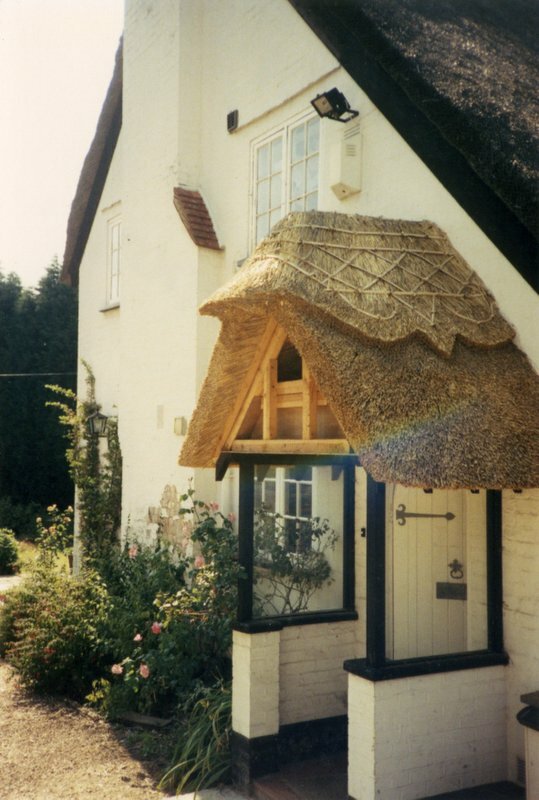 Generally, however they involve dealing with one of 4 things; Thatching a previously unthatched premises, coating an old thatch, working with the ridge, Protecting thatch from birds, vermin or wind damage. In this instance the thatch is fixed directly to the roof frame, either to a new structure or after all existing thatch has been removed. In the past, fixing was done mostly by tying to the roof rafters (or sometimes the battens) with various materials, for instance twisted hazel rod, tarred twine etc. Tying is now rarely used as a fixing for a main coat (although it is still used to fix base coats) and the most common fixing method these days is by crook and sway. A crook is a large spiked hook driven into each rafter to hold down a horizontal rod (sway) made of either wood or more commonly, steel. The sway clamps each course of material to the roof and each successive course covers the fixings of each previous course. The first course is laid at the eaves and the work then continues up the roof with the ridge covering the fixings of the final course. Porches come in all different shapes and sizes and are often an addition to protect the entrance space from the weather. 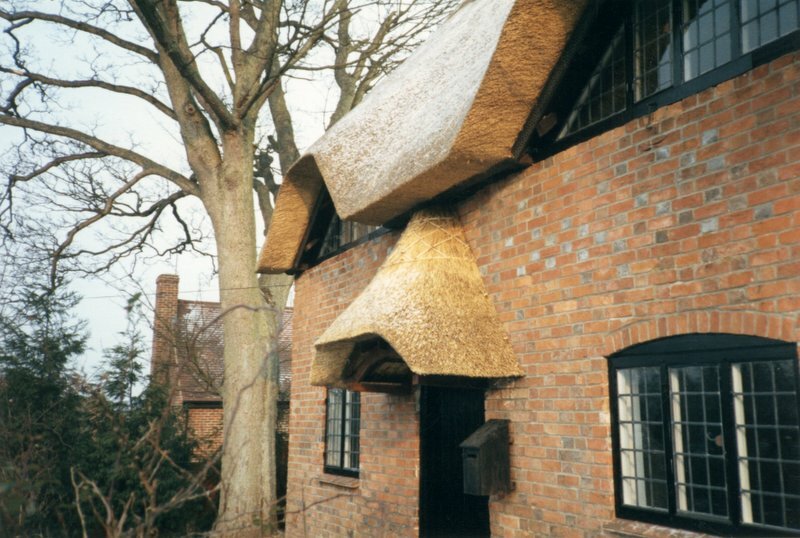 They are often quite challenging to thatch, as the material has to be turned in a small space - material selection is important here.